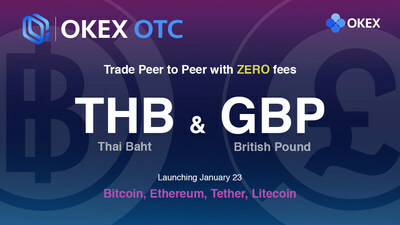 VALLETTA, Malta, Jan. 23, 2019 /PRNewswire/ -- OKEx, the Malta-based world-leading digital asset exchange, announced to launch two new currencies – Thai Baht (THB) and British Pound (GBP) on its over-the-counter (OTC) trading platform (also referred to as fiat-to-cryptocurrency platform). Users in Thailand and the United Kingdom can now complete KYC verification to be eligible to trade on the OTC trading platform. OKEx OTC trading allows users to place orders with self-selected exchange rate and payment methods to buy or sell Virtual Financial Assets with fiat currencies, which benefits them by offering a low-volatility market and zero transaction fee. Instead of the listing of the new currencies, Thai Baht (THB) and British Pound (GBP), OKEx OTC trading platform has already been facilitating global digital assets trading with the Vietnamese Dong (VND) and Chinese Renminbi (CNY) fiat-to-cryptocurrency markets, and more currencies are expected to come in at a later time this year. The Thai Baht (THB) and British Pound (GBP) OTC trading markets currently support BTC, USDT, ETH, and LTC. "Our mission is simple at OKEx. We aim to offer flexibility and convenience to our traders. Thailand and the UK own the fastest growing crypto communities in the world. We see great potential in these two markets and want to support the needs there. Because of the increasing trading volume and number of traders in these two countries, we decided to launch the new THB and GBP trading services on our OTC trading platform. Wherever the market potential locates, we will expand to there. In 2019, you can expect more currencies will be supported on OKEx," said Andy Cheung, OKEx's Head of Operations. To celebrate the launch, OKEx has come up with new incentives to encourage new sign-up for merchants and customers in Thailand and the UK. From January 23 to 27, newly registered customers can earn up to 50 USDT for making a minimum deposit of 100 USDT (or equivalent) and complete their first OTC transaction on OKEx, while the top 70 merchants with the most transaction volume will be rewarded 30 USDT (1 time per day). In addition, the OKEx OTC Network Launch events will be hosted in Bangkok, Thailand on February 13, 2019 and London, UK in March respectively. For more details, please refer to OKEx Twitter. Risk Warning: Trading digital assets involves significant risk and can result in the loss of invested capital. Users should ensure that they fully understand the risk involved and take into consideration their level of experience, investment objectives and seek independent financial advice if necessary.